I read this book in 10th grade, but the gravity of the subject totally escaped me. I don't recall being moved at all. Maybe it was the teacher's fault for not making us contemplate the horrific atrocities contained between its covers. Or maybe it was my own fault for not paying attention to the "theology of protest" Wiesel was putting forward on its pages. Either way, I happened to hear some people talking about this book recently and audible.com had it on sale, so I gave it another try to see if I had missed something the first time. To say that I had missed something is an understatement. I had missed everything! The story took me from disbelief to tears, from tears to nausea, from nausea to more tears, and from those tears to a numb silence. 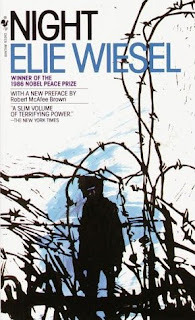 The book is a firsthand account of the Holocaust in which Wiesel narrates his own experience of being deported from his Jewish community in Sighet. He was fourteen years old when the deportation train that carried him and his family arrived at Auschwitz. He remembers the sight and smell at the moment of arrival: "In front of us flames. In the air that smell of burning flesh" (p. 26). The family was broken up a few minutes later. Eight words spoken quietly, indifferently, without emotion. Eight short, simple words. Yet that was the moment when I parted from my mother. I had not had time to think, but already I felt the pressure of my father's hand: we were alone. For a part of a second I glimpsed my mother and my sisters moving away to the right. Tzipora [the youngest sister] held Mother's hand. I saw them disappear into the distance; my mother was stroking my sister's fair hair, as though to protect her, while I walked on with my father and the other men. And I did not know that in that place, at that moment, I was parting from my mother and Tzipora forever" (p. 27). The book chronicles the attempts of Elie and his father to stay together at all costs. They lied about their ages and bargained with rationed food. When Elie's father fell ill, Elie took the role of an invalid so he could remain at his father's side. They did this until, eventually, at Buchenwald, his father passed on in the night. "I climbed into my bunk above my father, who was still alive. It was January 28, 1945. I awoke on January 29 at dawn. In my father's place lay another invalid. They must have taken him away before dawn and carried him to the crematory" (p. 106). Finally the liberating forces arrive at Buchenwald to free the prisoners. The dehumanizing conditions had taken their toll. Wiesel recalls, "Our first act as free men was to throw ourselves onto the provisions. We though only of that. Not of revenge, not of our families. Nothing but bread" (p. 109). I struggle for anything to say about this book. I cringe at the implications it carries for contemporary theological study. For example, one historian of the Holocaust has stated (in terms too binary for my liking), that "either God knew about the concentration camps and did nothing, and is therefore unjust, or he did not know, and then we do not need him". I personally think that's a false either-or, but that's the way many people have chosen to make sense of it. Other people have approached post-holocaust theology in different ways. See, for example, the other books by Elie Wiesel or Facing the Abusing God by David Blumenthal. I listened to Night in one sitting on a road trip from Florida to Georgia, and after it ended I drove in silence for the next 2 hours. It's that kind of book: read it and weep. The historian remained unnamed, but was quoted in Joel L. Kraemer, "Maimonides and Post-Holocaust Theology," Washington Post October 27, 2008 (accessed online: 9/4/11).